Celebrate with The Wort Hotel at the 22nd annual 12 Days of Christmas, November 29 - December 31st. 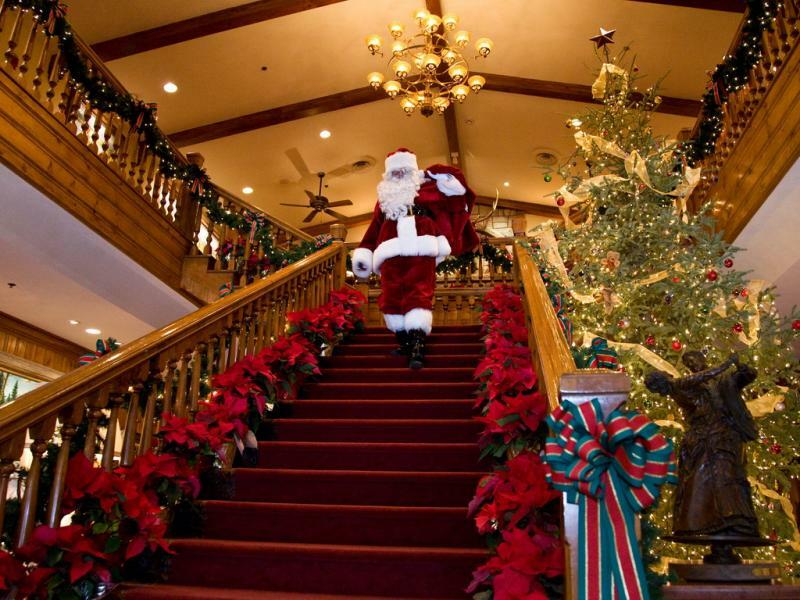 There's no merrier place to celebrate the holiday season than at the historic Wort Hotel in downtown Jackson, Wyoming. We'll have holly jolly happenings for all ages during our 12 Days of Christmas! Below is a schedule of all the fun activities. Bring the whole family to enjoy Lunch with Santa and much more. To download the full schedule, please click here. From 5-7pm enjoy live music and our annual Glenwood street lighting with Santa. Please dress warm because these events will be outside. Inside, we will have food and drinks and kids under 12 years old can eat for free in the Silver Dollar Grill. Sponsored by the Jackson Hole Historical Society, it's a wonderful evening of stories, music, refreshments and more. We are hosting an earlier kids show at 5:30pm and a later show at 7pm in the Silver Dollar Showroom. Reservations are not necessary. Thursday, December 13 - Gingerbread House Decorating - SOLD OUT! Join us in the Jackson Room or Goldpiece Room as we build Gingerbread Houses. This event is from 6-8pm and costs $50. Jackson Hole Playhouse will be performing in the Showroom at 10:30am. A holiday treat for all ages. $10 Adults / $5 Kids. Doors open at 10am, first come seating. Then at 11am stay for Lunch with Santa. This event will be a food drive for JH Food Cupboard. Bring a can and you get to see Santa! We will offer a special kid's menu and our regular lunch and drink specials. No reservations required, open seating. Please call for details, 307-732-3960. Wednesday, December 19 - Cookie Decorating - SOLD OUT! $16 per dozen, Reservations required, 5-7 p.m. Jackson Room. This event sells out, so make your reservations early! Please call 307-732-3960. Join us in the Silver Dollar Showroom as local preschoolers parade onto the stage to perform holiday songs for cheering crowds. Free, 10:30 a.m. Showroom. Tuesday, December 25 - Wort Hotel's Famous Christmas Buffet - SOLD OUT! This buffet of traditional favorites is something to look forward to! Be sure to make your reservation as seats do fill up. 11am-4pm. Call 307-732-3939. To view the full menu, please click here. Join us in the Silver Dollar Bar from 11am-6pm as Melvin Brewing takes over our taps. Later, we will host our first ever Melvin Beer Dinner. Enjoy a 8 course dinner paired for various Melvin craft beers. This event is from 6:30-10pm in the Clymer Room and costs $120/person. Please call 307-732-3939 to reserve your spot. For more information and to view the paired menu, please click here. From 7-11pm in the Silver Dollar Bar & Showroom. Enjoy live music with Chanman Roots Band, drink specials and raffle prizes including a YETI cooler, a Stio dry Bag and Day Passes to Jackson Hole Mountain Resort. Lazy Eyes will perform and we will be giving a prize for ugliest sweater. Free, 7:30-11pm, Silver Dollar Showroom. Enjoy drink specials all day from 11am-11pm, including $5 Bloody Mary's and discounted draft beers, to help nurse your holiday hangover away. From 7:30-11pm enjoy live music with The Famous Undercover in the Silver Dollar Showroom. Live music with Dirt road Band and party favors. Free, 8-midnight, Silver Dollar Showroom. To book one of our 12 Days of Christmas events please call 307-732-3960 (Event Reservations) or 307-732-3939 (Dining Reservations). Plan your winter stay at The Wort Hotel and save. We've got plenty of winter specials and packages for multi-day stays.